Policeman turned pimp Jung-ho (Kim Yoon-Suk) is having a tough time of it. His ladies of the night keep going missing, and Jung suspects a wealthy customer is kidnapping his women and selling them on for a tidy profit. He instructs one of his remaining girls, Mi-jin (Seo Yeong-Hee) to accompany the suspicious fellow to his palatial lair, then to call him once she’s inside so he will have the customer’s address and an idea if he is in fact the one causing the disappearance of his ladies. It turns out the customer is indeed causing the girls to go missing, but in a much bloodier and less entrepreneurial fashion than that suspected by Jung-ho. When Mi-jin fails to answer any of his calls, it is up to the wily ex-detective to locate the poor dear before she gets turned into mincemeat like each of the killer’s other hapless victims. Reluctantly taking Mi-jin’s young daughter under his wing, he races around town in hopes he can solve the riddle of her whereabouts before it’s too late. Not to be confused with the antics of the Aussie comedy troupe, this solid Korean crime thriller has been taking international festival audiences by storm. A tense and tersely-executed affair, The Chaser is a resounding success for writer and director Na Hong-Jin. Ha Jeong-Wu is chillingly effective as the demented psychopath with a penchant for taking a hammer and chisel to the heads of young streetwalkers, and Yoon-Suk puts in a charismatic and believable performance in his increasingly desperate attempts to play the hero. With an excellent two-part making-of included as a bonus feature and a Hollywood remake on the cards courtesy of the team responsible for The Departed, this is a strong and engrossing release that will reward fans of serial killer thrillers. 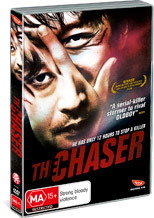 Atmospheric and containing enough subtle plot convolutions to keep you on your toes, The Chaser stands as one of the finest examples of Korean cinema in recent memory.